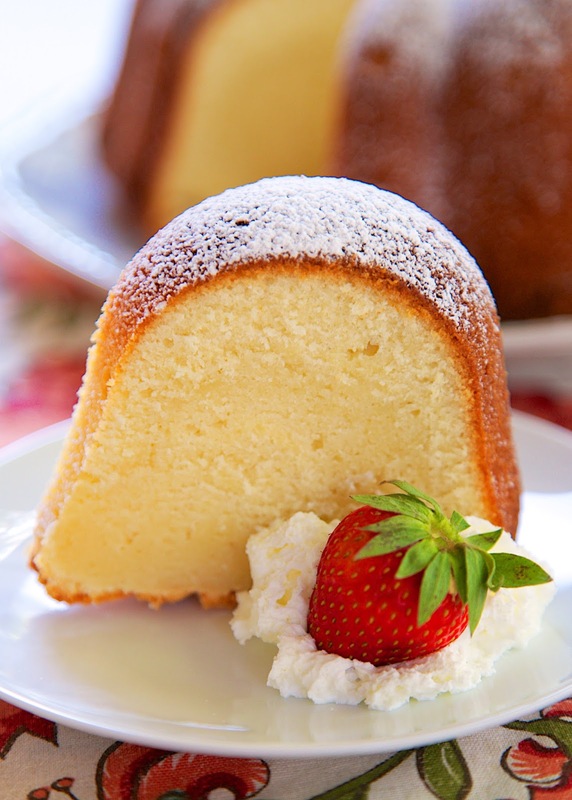 5-Flavor Pound Cake Recipe - homemade pound cake with tons of great flavor - Vanilla, Rum, Coconut, Butter, and Lemon - highly recommend serving it with some vanilla ice cream and fresh berries way at your Memorial Day cookout. I don't know about you, but I love a good pound cake. 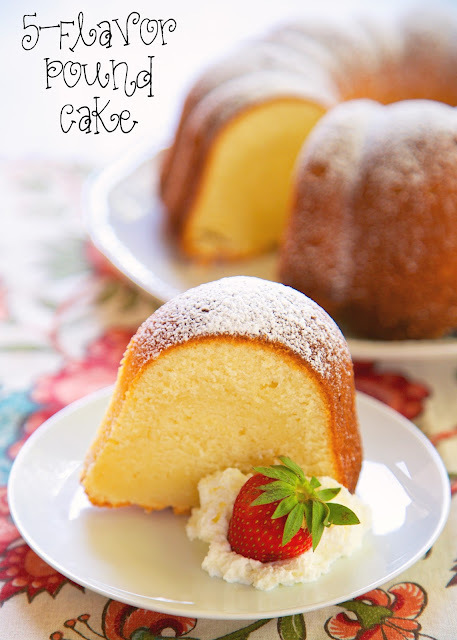 This pound cake has TONS of great flavors. It has 5 to be exact. :-) Vanilla, Rum, Coconut, Butter, and Lemon. YUM! It tasted great! I highly recommend serving it with some vanilla ice cream and fresh berries way at your Memorial Day cookout. This cake is great for a crowd. It can be made a day ahead of time. The cake will keep covered in an air-tight container for several days. My mother-in-law likes to freeze pound cake in slices so she has a sweet treat later. I think that is a brilliant idea! Preheat oven to 325ºF. Grease and flour a 10-cup bundt ban. Set aside. In the bowl of an electric mixer fitted with the paddle attachment, mix together the butter and shortening. Add sugar one cup at a time. Add eggs one at a time, mixing until the yellow disappears. Add vanilla, rum, coconut, butter and lemon flavorings/extracts. Sift flour and baking powder. Add flour and milk to batter alternately with flour being the last ingredient added. Pour batter into prepared pan. Bake for 90 minutes, or until toothpick comes out clean. Allow cake to cool in pan for 10 minutes. Remove cake from pan and cool completely on a wire rack. can i replace shortening with coconut oil? sounds great, do you measure flour first then sift it? Read the recipe again. Add sugar 1 cup at the time. Then it says add eggs 1 at the time.